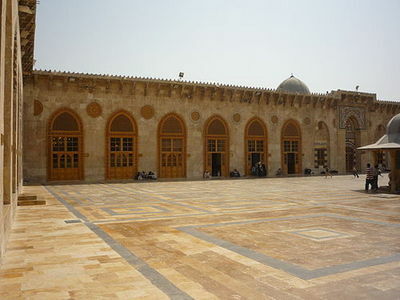 Courtyard of the Grand Mosque of Aleppo – Photograph 2008 Via Wikimedia Commons. The death in a Syrian hospital of Dr. Ibrahim Al-Salqini, the 77-year old Sunni Mufti of Aleppo and dean of theology at Damascus University, and a widely respected Sufi, has provoked suspicion about his passing, as reported in Western media, including the Los Angeles Times of September 6. Al-Salqini suffered a stroke and entered the hospital for treatment after he was visited by state security agents, according to Syria's opposition network, the Local Coordinating Committees. At the start of September, Al-Salqini delivered a Friday sermon interpreted as a challenge to the Al-Assad dictatorship. While he was undergoing medical treatment, his family was prohibited from visiting him. While Syrian state media claimed that the government's high clerics participated in Al-Salqini's funeral, irregular thugs known as "shabiha" joined security personnel in assaulting the mourners when they reached the burial site. Al-Salqini was one of a group of Aleppo Sunni clerics who issued a protest declaration last month against the repressive actions of the Al-Assad government. The petition denounced the shedding of the blood of the innocent, and described the state authorities as "the stronger party," with the greatest responsibility for the situation. The declaration called for "the rulers and others with the reins of power in their hands" to "stop the violence immediately," to "open up space for freedom of opinion and expression," to cease arbitrary arrests, release all prisoners of conscience, and speed up constitutional reform, especially the removal of Article VIII, which defines the Ba'ath party as the leader of the Syrian state and society. Signatories to the Aleppo declaration had included Al-Salqini, Dr. Muhammad Abu'l Fath, the mentor of Al-Salqini, and other well-known religious authorities, including Dr. Mahmoud Akkam and the respected Sunni elders Muhammad Zakaria Al-Masud, Muhammad Nadeem Al-Shihabi, Abdullah Al-Masud, and Yusuf Al-Hindawi. Sheikh 'Abd Al-Fattah Al-Bayanuni, another prominent Syrian Sunni spiritual leader, sent a message to Dr. Abu'l Fath in which he praised the late shaykh for showing "patience in the face of the harm caused by oppression and ignorance," and as one of the religious "scholars of the country, who, like stars in the sky, guide the believers through darkness on land and sea." Al-Bayanuni warned that without such religious models, the Syrian Muslims would lose their way. Another Syrian shaykh, Muhammad Al-Yaqoubi, praised Al-Salqini as "a man of the house of knowledge… who combined understanding of religious doctrine with piety, showed a good example in writing and in morals, and served all the people through his work. He offered mercy and love to those far from his presence." The official Syrian news agency SANA claimed on September 7 that Al-Salqini had died of a stroke, and announced that the regime of Bashar Al-Assad had offered condolences to Al-Salqini's family, along with similar statements by the official Grand Mufti of the Republic, Ahmad Badreddin Hassoun, and the governor of Aleppo, Ibrahim Khallouf.